F.O.E. donates more than $10 million a year to local communities, fundraisers, charities and more. As part of its philosophy, the F.O.E. gives back 100 percent of monies raised in the form of grants. Fundraisers are conducted for eight major charities, including kidney, heart, diabetes, cancer and spinal cord injury funds, a children's fund, memorial foundation and the Golden Eagle Fund. The Fraternal Order of Eagles has nearly 1,600 locations across the United States and Canada, dedicated to improving our communities and helping others. 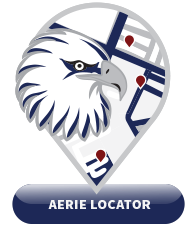 Use our Aerie Locator tool to identify the Aerie closest to you.